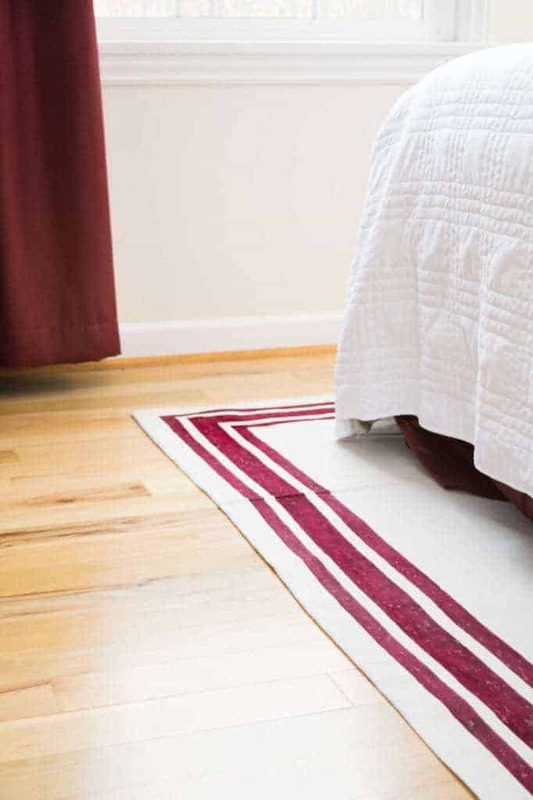 Area rugs can be so expensive, and it’s almost impossible to find the perfect one for your space. 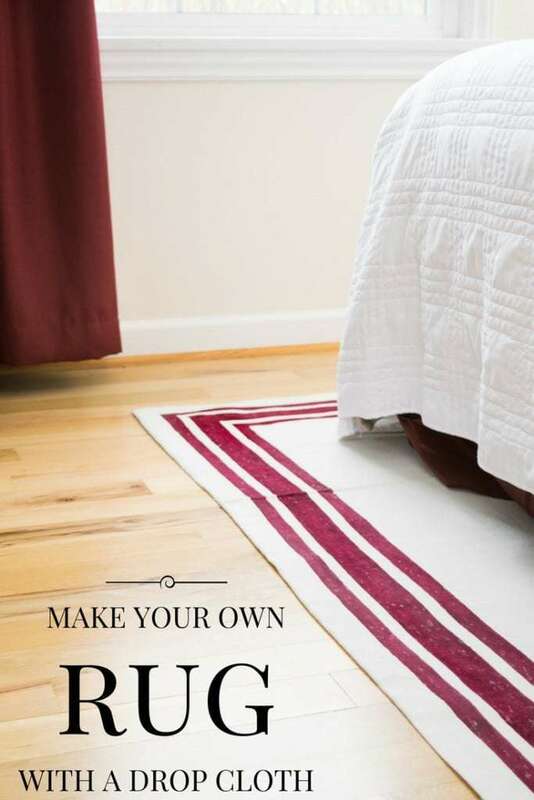 Why not make your own rug? 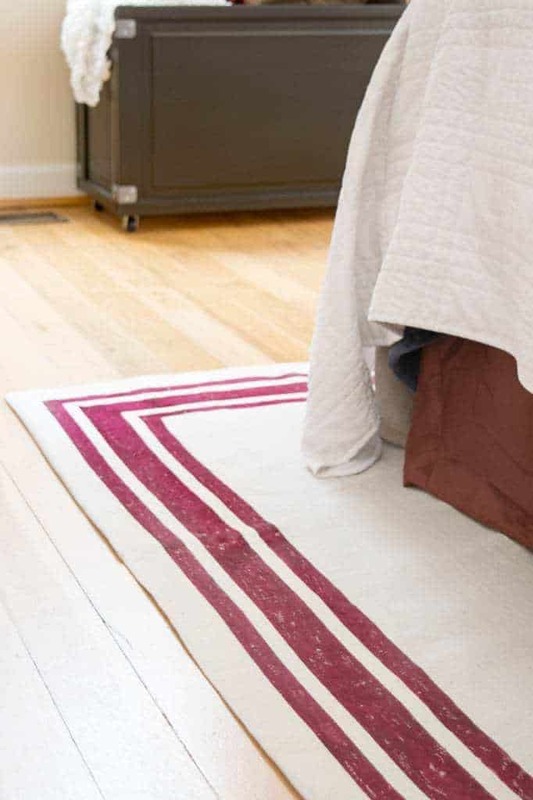 Using just a drop cloth and fabric paint, you can create a custom area rug that coordinates with your decor for a fraction of the price! This post contains affiliate links for your convenience. For more information about how you can support this site at no cost to you, please visit my disclosures page. I searched for months for the right area rug to go in our living room, and I wasn’t looking forward to repeating the process for the master bedroom. The solution hit me when I was applying textured wallpaper to the wall behind the bed. The drop cloth protecting the floor from wallpaper paste drips was a perfect color match! With a little fabric paint, I could transform a drop cloth into a simple area rug. My drop cloth is 12′ x 15′ for an 8′ x 10′ rug. I’ll be folding the extra length under to create a double layer around the edges, but you can use a smaller drop cloth too. DecoArt provided me with their SoSoft fabric paint in Dark Burgundy for this project. Start by washing and drying your drop cloth. It will come out in a big, wrinkled ball, and your lint trap will be completely full! Larger drop cloths like this 12′ x 15′ are typically smaller ones sewn together. Mine is made up of three 4′ wide panels. You can use this to your advantage! These seam lines will be your guidelines to create perfectly straight edges at the folds. This process will work best for a rug that will be under a piece of furniture like a bed that will hide the seams. 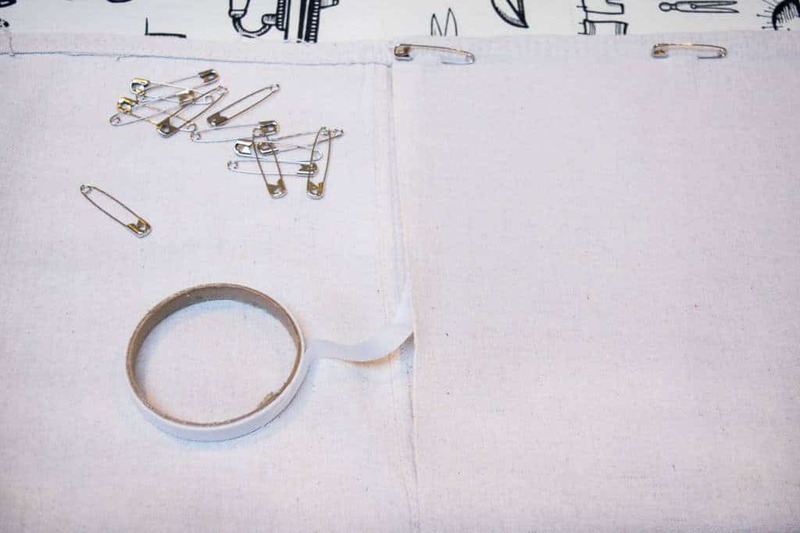 After ironing the first section of drop cloth, fold the edge over to meet the closest seam line. You’re basically making a giant hem. Apply fusible web to the edge and iron until it adheres in place. Then press the fold to make a nice, clean edge. I used large safety pins to keep everything in place. Repeat this process for the other side. If you started with a 12′ x 15′ drop cloth, it should now be about 8′ x 15′. Now fold and fuse the other ends to create the final size of your rug. 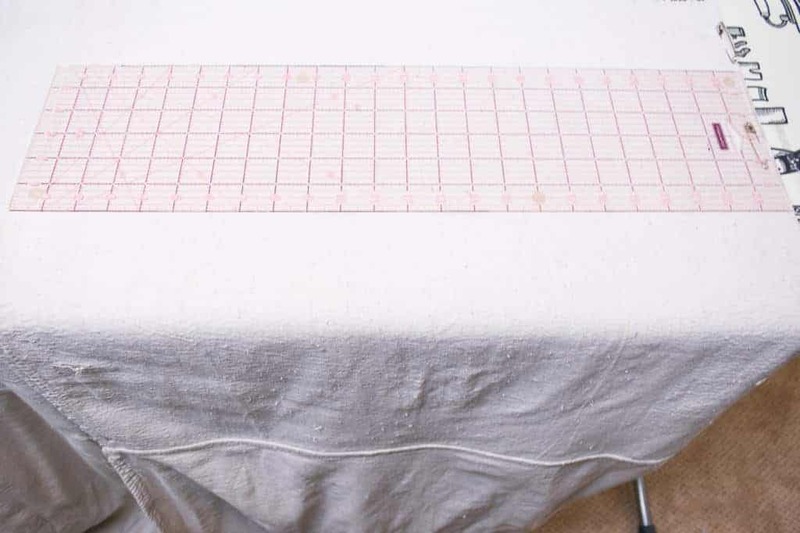 I used my 24″ quilting ruler to create even hems. The final dimensions of my rug are roughly 8′ x 10′. After spending far too much time at the ironing board, it’s finally time to get to the fun part! 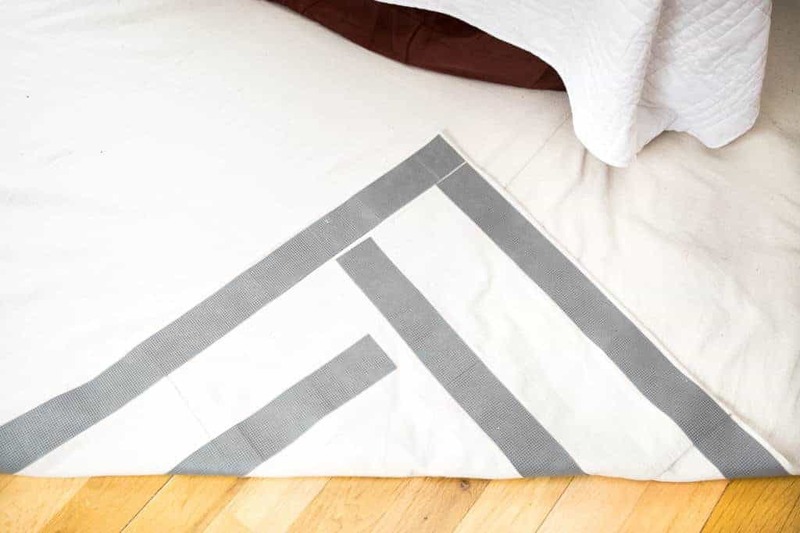 First, lay out your new rug and attach area rug tape to the edges. This will keep it from slipping, both while you paint and when you walk on it afterwards. Next, break out your fabric paint, painter’s tape, and a foam brush. I’m going for a simple striped border in burgundy to match the rest of my bedroom decor. I started by applying the widest painter’s tape along three of the folded edges. The fourth edge will be under the bed and nightstands, so I didn’t bother painting it. It might seem like a lot of taping, but trust me. This is a lot easier than marking out each line with a ruler! Now that you’ve taped everything off, it’s time to remove a few of them to make the stripes. Peel off every other row, making sure all the remaining tape is firmly in place along the edges. Now, we paint! 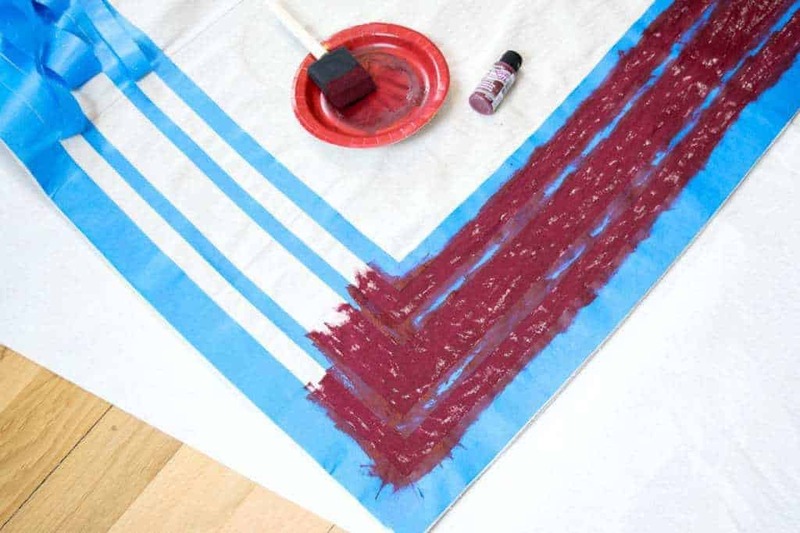 Use the foam brush to spread the fabric paint from the tape to the center to prevent as much bleed-through as possible. 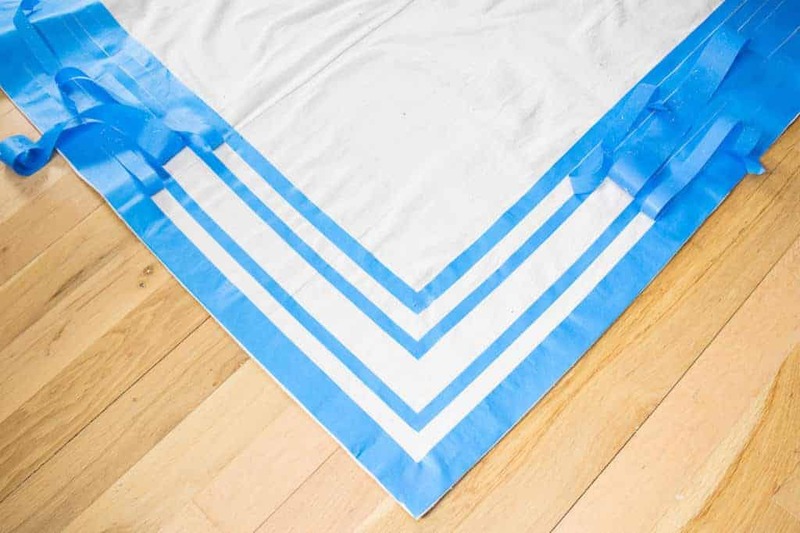 There should be enough layers of drop cloth to prevent the paint from seeping through to the floor, but you might want to protect it with another drop cloth or some paper just to be safe. 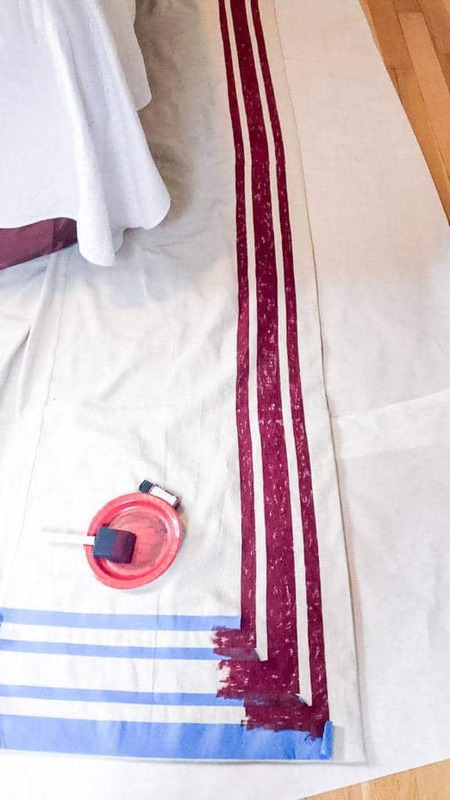 To give my stripes a slightly worn look, I left some of the drop cloth color showing through. I was worried that I would need two coats to get a deep burgundy, but the SoSoft fabric paint kept its color with just one coat! For a rug of this size, I needed six bottles for three sides. When you get to a corner, paint a few inches of the next side, then remove the painter’s tape. Don’t give the excess paint time to seep under the edge and mess up your crisp lines! The paint was dry in a few hours, and I moved the rug into position. It took a little tugging and pulling to get the sides of the bed even, but I was very happy with the result! I love how the stripes echo the lines of the blanket box (see the full tutorial for how I built it here). It’s so nice to finally have something soft under my feet when I first wake up in the morning! The double layer of drop cloth around the sides of the bed makes it feel more substantial underfoot. Finding a matching red can be impossible, especially when you’re buying a rug online. Instead of dealing with the hassle of buying and returning huge area rugs that aren’t the right hue, I could customize the stripes to blend in perfectly! Time will tell how well the drop cloth area rug holds up. I may end up sewing the edges if they become a problem, but so far it’s working better than I expected! Not bad for a $30 drop cloth! If you would like to keep up to date with my latest posts about home decor and more, you can follow me on Facebook, Pinterest, or sign up for my weekly newsletter below. Another great use for drop clothes!! This turned out great. We’re renovating a family home, and this would a great project for one of the rooms. Great job! I love a good drop cloth project and this is one! I really like the stripe around the edge. Rugs are indeed so expensive! It’s crazy. Love this. Thank you for sharing your creativity with us at Merry Monday. I love this, it’s so beautiful! Thanks for sharing on To Grandma’s House We Go! I love drop cloth and grain sack stripes! I have made rugs on canvas before they held up quite nicely. I think it’s going to be just great. The edges on mine eventually started to turn up. Thanks for sharing with SYC. Love this idea. I made a tee pee from drop cloth before. They also make great curtains. Love how well your diy turned out. Thanks for sharing this with us at the Inspiration Spotlight party. Pinned and sharing. 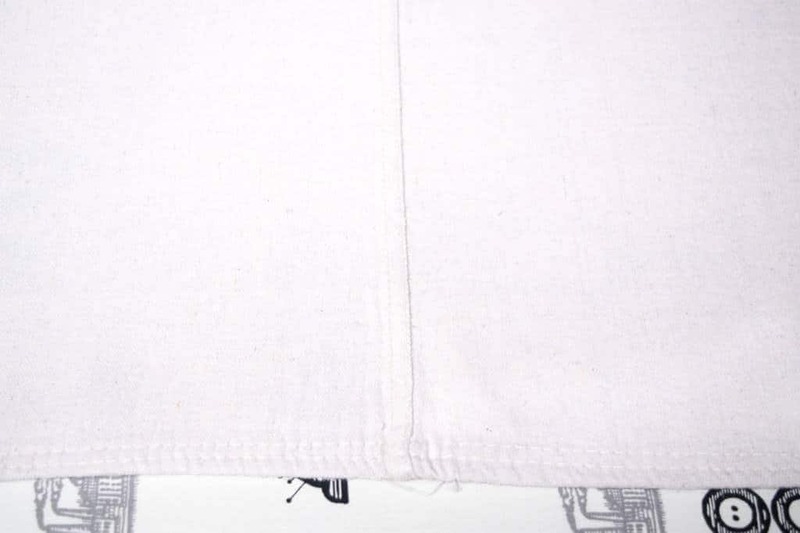 They’re thicker with more coarse fibers than linen or muslin. Maybe cotton canvas?